The date is May 7, 1747 . The place is the grounds of the ornate palace of Frederick the Great, King of Prussia. Johann Sebastian Bach, the greatest musician of his time, now 62-years-old, has just arrived at the lodgings of his son, Carl Philip Emanuel Bach, the court’s musical director. Inside the palace, an officer, approaching a large room where the King is to be found, hears the high-pitched strains of a melodious flute, and the sounds of sonorous stringed instruments tuning up. He carries the list of newcomers to the court. It is Frederick, himself, who is warming up his flute, for the private concert to be held that night, as every other night. Flute in hand, Frederick looks down the list, and turns to the assembled musicians, exclaiming, with a kind of agitation in his voice, “Gentlemen, old Bach is come.” He lays his flute back in its case, and gives the order that there will be no regular concert tonight. The King guides Bach to the first fortepiano, with all the musicians following. Bach, known throughout the land for his great improvisational abilities, sits down, and begins to play. The musicians have never before heard someone play unpremeditated compositions like this. They all proceed, from room to room, and at each fortepiano, Bach invents yet another beautiful polyphonic (many-voiced) piece, even more inspired than usual by the new possibilities to create dynamical shading. The King’s theme begins with a C minor triad, (“c - e flat – g”), is raised to the next half-note above that, “a flat,” and then takes a dramatic downward leap of a seventh from the "a flat" down to “B,” not included in C minor, but found in C major. This creates musical tension between two pairs of half-step intervals: from the ”B” back to the beginning “C,” and the “g - a flat” interval. Listen here the the entire 3-voiced Ricercar, performed on the piano by Carlo Levi-Minzi from a recording by the Humanist Academy. Find the Royal theme as it presented in three voices at the beginning of the piece. If not, how do they differ? Find the Royal theme’s appearance in the rest of the piece. After you have thought about this, see: footnote [i]. The King, admiring the learned manner in which Bach develops his theme with three voices, asks to hear a fugue with six independent voices. Bach, fearing that he cannot, without preparation, invent such a complex fugue on the King’s subject, instead, chooses a subject of his own, and, to the astonishment of all, proceeds to execute it in the same magnificent and learned manner as before. After returning home to Leipzig , Bach composes both a three-voiced and a six-voiced fugue on the King’s subject. He also writes ten canons, and a trio for flute, violin and keyboard instrument, on the same royal theme. This masterpiece is rightly considered one of the milestones in the history of classical music. The following is this author’s dramatization of the account of Bach’s visit to King Frederick, related by Bach’s eldest son, William Friedemann, who accompanied his father, as told to Bach’s first biographer, Johann Nikolaus Forkel. The New Bach Reader, pp. 429-30. The Silbermann fortepianos were so-named because they were the first keyboard instruments constructed to play dynamical nuances from forte (loud) to piano (soft). The authorship of this ingenious theme has been debated. Was it really the King, or was it Bach, himself? 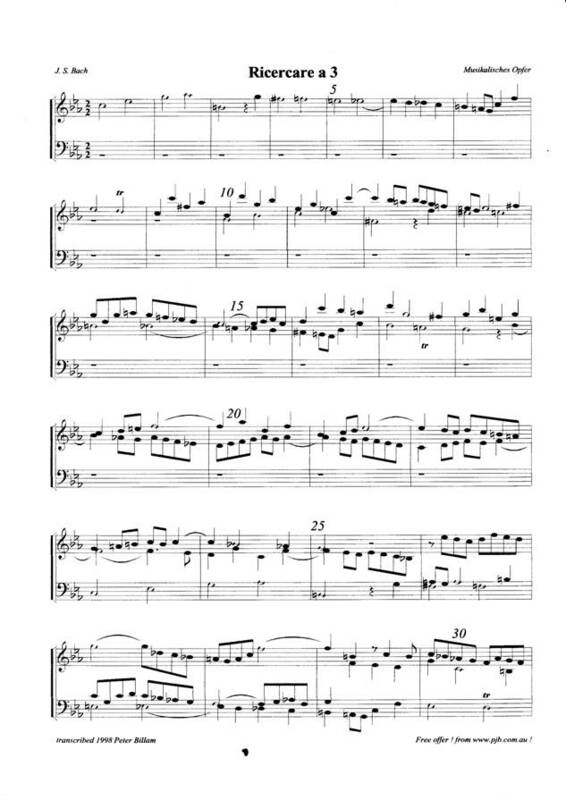 It could actually be both – Look at the following theme by Bach from his Fantasy and Fugue in c from ? ?, and notice the similarities. Could the King have invented a variation of one of Bach's own themes with which to test the music master? Music in the Baroque Era, by Manfred F. Bukofzer, W.W. Norton & Co., New York , 1947, pg 277. The second voice, the “answer,” appears in measure 10, and begins on “g.” This can be both considered as a fourth below “c’,” or an octave below the fifth above “c’” which is “g’.” In the most common type of fugues, the “answer” begins on the fifth above the first presentation of the theme (or, as in this case, the fifth above is transposed down by an octave). Notice that the “answer” does not have exactly the same intervals as the first, for example, the interval between the second and third notes are decreased to one whole step, whereas, in the first voice, it was a major third (2 whole steps). Here, the interval between the 3rd and 4th is enlarged to become 1 ½ steps. This slight shift enables the “answer” to be in the same key as the first voice, and is very common in fugues. Here you can get a sense of certain boundries in a "curved" musical space. In this example, if the theme were transposed up by exactly the same interval -- a fifth, the shape would, in fact, become distorted. What would the second voice be like, if it maintained the exact intervallic relationships as the first voice? The third voice, beginning in measure 23, begins on “C,” two octaves below the first voice.